​Every gift—large or small—helps to support another student, fund an important program and secure our place as our region's premier law school. 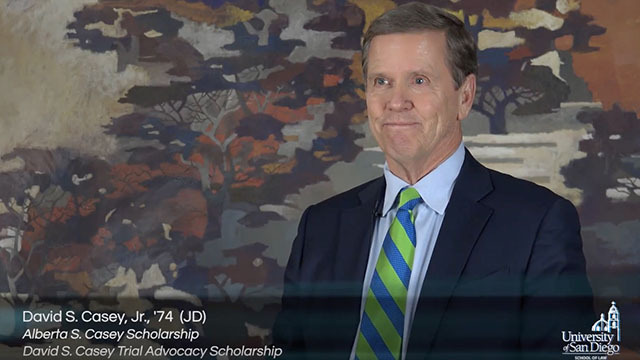 At USD School of Law, private philanthropy provides a margin of excellence that ensures we can continue providing a world-class legal education for our students. It plays a critical role in providing scholarships for deserving students, attracting and retaining top faculty who are leaders in their respective fields and supporting our various programs and initiatives that help meet the needs of our local community. Every day, the impact of our donors is felt by our students and by those who benefit from programs. These impacts are felt beyond our campus and have far reaching impacts that touch the lives of so many here on our campus, in San Diego and throughout the country and world. The Office of Development and Donor Relations is committed to supporting the mission of USD School of Law through increased financial support from the law school's alumni and friends. Thank you for your interest in making an impact on USD School of Law and helping us provide a world-class legal education that will continue to educate tomorrow's leaders. With a gift of $5,000 or more, you can establish and name your own annual scholarship fund. By investing in scholarships, you are making an impact on current and future students, as well as the future of USD School of Law.